That’s the last piece of advice head coach Peter Campbell of the Wilfrid Laurier Golden Hawks would give Laurier. The men’s basketball team was eliminated from the Ontario University Athletics playoffs last Wednesday night 98-80 against the Brock Badgers in the first round, marking the end of an era — not only for graduating seniors Will Coulthard and Garrison Thomas, but it was also Campbell’s final game coaching the team. The bench boss has officially finished his 31-year career as a head coach and is heading into retirement. The Hawks did a lot of things Campbell liked during the playoff game against Brock — the team was outrebounded badly during their last meeting and in the first quarter the Hawks held their own. The Badgers built their team around offensive rebounding, and the Hawks held them to only three offensive rebounds after the first quarter and trailed by only seven points by the end of the first half. But the Hawks were never truly out of the game as third-year Matt Chesson scored seven quick points to get Laurier back in it with the Badgers. It was only in the fourth quarter Brock started to pull away and soon the Hawks were just trying to play it out. Campbell said at the beginning of the year the Hawks had a chance of making it to the Final Four, and could win the OUA West conference, but as the guys started to play, he realized that the team wasn’t gelling the way he was hoping. 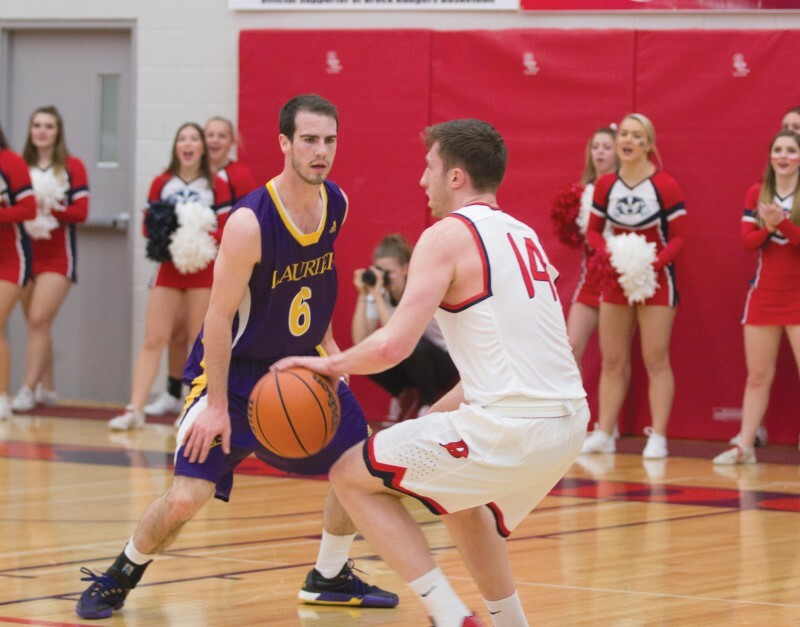 So he re-evaluated — if they could get to the game on Wednesday, it could be considered “a good year” for Laurier. But what also needs to be considered is how competitive basketball is in Ontario. Three of the top teams in Canada are from Ontario — the McMaster Marauders are fifth, and the Badgers sit as the eighth best team in Canada. The season could also be thought of as a farewell tour for Campbell, as he made his final visits to the gyms he coached in and against opponents for the last 31 years. Some of his most memorable moments were the home game against the Western Mustangs when they were struggling and Mustangs forward Greg Morrow was punishing them — the Hawks did some things that they hadn’t been doing and turned it around and played hard to tie it and won it in overtime. There’s also the match against the Guelph Gryphons when Owen Coulthard had a nearly perfect game until he shot the ball while he was falling down, and the game against the Waterloo Warriors because it was nicely paced and there wasn’t a lot of pressure. And of course, the game against the Laurentian Voyageurs when he was given a jersey by head coach Shawn Swords and Paul Hurley of the Voyageurs men’s and women’s basketball teams in Campbell’s final visit to Ben Avery gym — a place he spent a large amount of his career. As Campbell prepares himself to retire, he wishes to leave one last piece of advice — not just with the team, but with the entire community at Wilfrid Laurier. And that’s to hold yourself accountable.